For 100 years, spoilsports and goody-goodies have been alarmed and horrified at the violence and sexual undercurrents in "Peter Pan'' and have done all they could to stifle them. In recent days it has snowed in Seattle, Portland, and get this, Las Vegas! But not here in the Bay Area. Just buckets and buckets of rain. When I was a kid, I was a huge basketball fan, and the Denver Nuggets were my team of choice. I mean, I was fanatical: I knew the uniform number, scoring and rebounding averages, height, and weight of every player. I had occasional bad tantrums when the Nuggets lost a big game. The greatest player the Nuggets ever had, and one of the best in history, was David Thompson. 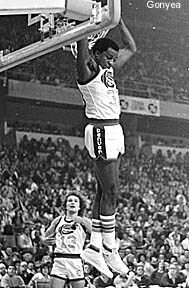 Although he was only about 6'2", he could jump higher than anybody, and he was incredibly quick. He was also a very accurate shooter. His career was cut short by drug and alcohol problems, but he got his life back together and has been clean for 15 years. And just last week, he fulfilled a promise to his mother by graduating from college. His autobiography has recently been published. Now I know what I'm going to do with that Amazon gift certificate I got for my birthday last week. It was only about 8 months ago that the idea of a way to buy songs online was radical. Apple's invention of the iTunes Music Store made it real. Soon, imitators created other music stores with similar features, such as free preview clips, the ability to buy songs for about a buck without membership fees, and relatively liberal usage rights. Now, apparently, anybody can build an online music store by using a new service from Microsoft and Loudeye. Nothing changes: Apple innovates, and then others commodotize. To stay successful, Apple has to keep running as fast as it can to invent new stuff. Phil Goldman was only 39 years old when he died, unexpectedly and incredibly, a couple of days ago. Phil was a true Silicon Valley star. He was one of the original authors of MultiFinder, a brilliant hack that allowed the Mac to run more than one application at a time without preemptive multitasking. Phil became one of the first employees at General Magic in late 1990, where he was hired as "Andy 2" -- somebody to take workload from Andy Hertzfeld. At Magic, Phil wrote much of the OS and memory management code. Phil would often work late into the night, spending remarkably long hours coding. After Magic, Phil co-founded WebTV, which he and his partners eventually sold to Microsoft . Phil worked at the Microsoft version of WebTV for a few years before leaving and founding Mailblocks. Phil was smart and had a wry sense of humor, and he was a truly nice guy. He was a fan of pop culture and loved to have a TV going as background noise during his all-night work sessions. Phil was always pushing, trying to make the products he worked on a little more advanced or a little better. Phil was married to the former Susan Rayl and they had 2 young children. I have lots of memories of fun times with Phil at Magic, and although I haven't seen him much since I left Microsoft, I'll miss him. Phil's death is a tremendous loss for a great number of people. I'm very sad to report that one of the coolest restaurants in San Francisco is closing in a few days. Today we present the festive traditional holiday story of the humming toadfish of Sausalito. Merry nondenominational winter season! Happy solstice-adjacent-religious-holiday! Barbara came home yesterday after 5 days in the hospital. She was sick all last week with a virus, then ended up in the emergency room on Friday with what turned out to be severe anemia: she had lost two-thirds of her blood to abdominal bleeding. She had transfusions to improve her blood count, then fought a fever for a couple of days until she was well enough to go home. She spent two sleepless nights in an insanely noisy unit that included the usual hospital clanging and poking, as well as a really unfortunate patient who loudly growled like a bear all night. As Warren says, hospitals are for intervention, not rest. Her terrific doctors got her moved to a very quiet part of the hospital, and the incredible nursing staff worked to leave her alone for a couple of night so she could sleep. That helped her get better. It seems to me that the role of rest and sleeping is not yet well respected by most hospitals. Her virus turned into something much worse yesterday, so we made another trip to the emergency room. She was diagnosed with severe anemia. After getting a blood transfusion, she's much better today. She'll stay in the hospital for a few days to make sure she keeps getting better.